- 3 days of general admission to the Cairns Aquarium to be used within 1 month. 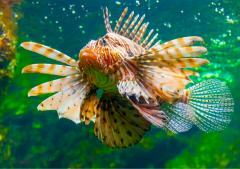 - Daily talks, presentations, marine and reptile touch tanks. When you know that one visit to the Cairns Aquarium is just not enough, then consider a Multi Day Pass, allowing you 3 days of access to the Cairns Aquarium in a one month period. Immerse yourself in two adjoining World Heritage listed areas, the Wet Tropics Rainforest and the Great Barrier Reef and explore the habitats and species of 10 unique eco systems. Enjoy talks and presentations, marine and reptile touch tanks and daily animal feeds. Child: 3-14 years inclusive - child rates apply.